Sitting in a company of the doctors of the law. ESUS WAS BROUGHT to Nazareth when he was a little child not more than three years old; there he grew up as a boy and a young man, and there he lived until he was thirty years of age. We should like to know many things about his boyhood, but the Bible tells us very little. 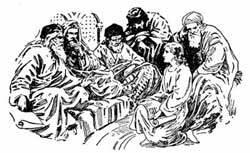 As Joseph was a working man, it is likely that he lived in a house with only one room, with no floor except the earth, no window except a hole in the wall, no pictures upon the walls, and neither bedstead, nor chair, nor looking-glass. They sat upon the floor or upon cushions; they slept upon rolls of matting, and their meals were taken from a low table not much larger than a stool. Jesus may have learned to read at the village school, which was generally held in the house used for worship, called the "synagogue." The lessons were from rolls on which were written parts of the Old Testament; but Jesus never had a Bible of his own. From a child he went with Joseph to the worship in the synagogue twice every week. There they sat on the floor and heard the Old Testament read and explained, while Mary and the younger sisters of Jesus listened from a gallery behind a lattice-screen. The Jewish boys of that time were taught to know almost the whole of the Old Testament by heart. It was the custom of the Jews from all parts of the land to go up to Jerusalem to worship at least once every year, at the feast of the Passover, which was held in the spring. Some families also stayed to the feast of Pentecost, which was fifty days after Passover; and some went again in the fall to the feast of Tabernacles, when for a week all the families slept out of doors, under roofs made of green twigs and bushes. When Jesus was a boy twelve years old, he was taken up to the feast of the Passover, and there for the first time he saw the holy city Jerusalem, and the Temple of the Lord on Mount Moriah. Young as he was, his soul was stirred, as he walked among the courts of the Temple and saw the altar with its smoking sacrifice, the priests in their white robes, and the Levites with their silver trumpets. Though a boy, Jesus began to feel that he was the Son of God, and that this was his Father's house. His heart was so filled with the worship of the Temple, with the words of the scribes or teachers whom he heard in the courts, and with his own thoughts, that when it was time to go home to Nazareth, he stayed behind, held fast by his love for the house of the Lord. The company of people who were traveling together was large, and at first he was not missed. But when night came and the boy Jesus could not be found, his mother was alarmed. The next day Joseph and Mary left their company and hastened back to Jerusalem. They did not at first think to go to the Temple. They sought him among their friends and kindred who were living in the city, but could not find him. On the third day, they went up to the Temple with heavy hearts, still looking for their boy. And there they found him sitting in a company of the doctors of the law, listening to their words and asking them questions. Everybody who stood near was surprised to find how deep was the knowledge of this boy in the word of the Lord. His mother spoke to him a little sharply, for she felt that her son had not been thoughtful of his duty. She said: "Child, why have you treated us in this way? Do you not know that your father and I have been looking for you with troubled hearts?" "Why did you seek for me," said Jesus. "Did you not know that I must be in my Father's house?" They did not understand these words; but Mary thought often about them afterward; for she felt her son was no common child, and that his words had a deep meaning. Though Jesus was wise beyond his years, he obeyed Joseph and his mother in all things. He went with them to Nazareth, and lived contented with the plain life of their country home. As the years went on, Jesus grew from a boy to a young man. He grew, too, in knowledge, and in wisdom, and in the favor of God. He won the love of all who knew him, for there was something in his nature that drew all hearts, both young and old. Jesus learned the trade of a carpenter with Joseph; and when Joseph died, while Jesus was still a young man, Jesus worked as a carpenter, and helped his mother take care of the family. And so in the carpenter shop, and the quiet life of a country village, and the worship of the synagogue, the years passed until Jesus was thirty years of age.